Building generational wealth takes time, knowledge, and focus. 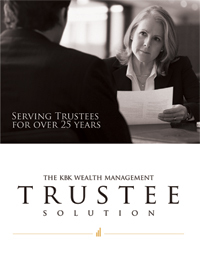 KBK Wealth Management has over 25 years in servicing trustees with a guided hand and prudent advice. The “KBK Trustee Solution” was designed to assist trustees in fulfilling their fiduciary duty to the trust and, ultimately, its beneficiaries. This comprehensive solution provides a complete suite of services to assist the trustee with staying compliant and helping to reduce legal exposure.